Is money a fighting word in your marriage? Since we all know that sometimes finances can be a huge issue, we are so excited to announce we are offering a fire family Financial Peace group led by certified instructors and available to our members at a discounted price! A couple of years ago my husband took a promotion in his company which meant a pay decrease for us as he went from sales to management. We knew we’d have enough to take care of our family, but we weren’t sure how we’d be able to pay down our debt and continue to save for the future. The first few months were rough and we ended up dipping into our savings while trying to figure out how to make the adjustment to the new income. A friend of mine from out of state came to visit and told me she taught the Dave Ramsey course. She sat down with me and in an hour or two gave me several tips and suggestions as we went over a couple of the spread sheets. The next week our church started advertising the FPU course so we signed up. By learning the seemingly basic but crucial guidelines, tips and advice Dave taught, we were able to not only come up with a manageable monthly budget, but we also paid off both of our cars (which was about $40k worth of debt!) Plus we have an emergency fund and we are now up to 4 months worth of living expenses in our savings account. All of this within a year of taking the course! The class will be led by a Dave Ramsey Certified instructor who specializes in military and first responders. Each couple will get online videos and a workbook and a meeting a week for 12 weeks. Meetings will be online and we encourage participants to join the meetings even if their spouse is unavailable at the time. Meetings will be recorded and can be viewed again later or shared with your spouse when they are available. This is a 12 week program. Each week you will watch a video in advance of the session (Videos will be available online so you can watch them at your convenience.) and work through homework in the workbook. Meetings will be online on Thursdays at 9:30pm EST starting February 6th. The fee is $50 per Fire Wife or couple. Let’s be the DEBT FREE SCREAM! To participate you must be a member of the Sisterhood. 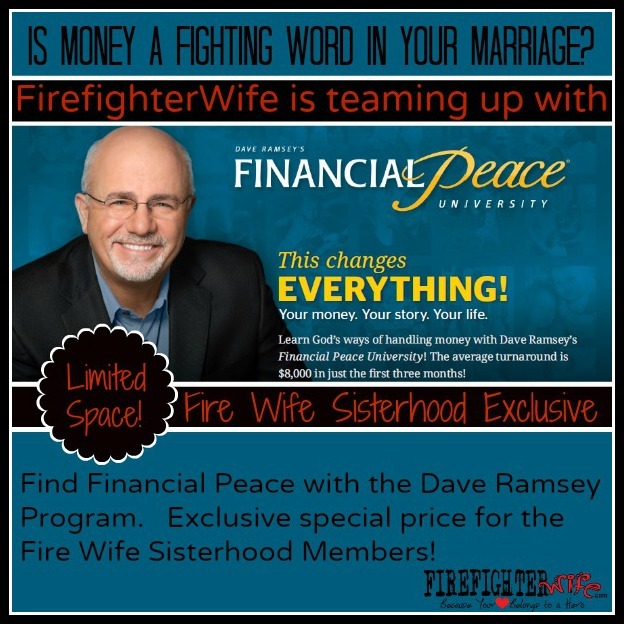 The Fire Wife Sisterhood membership is $8/month or $60/year. 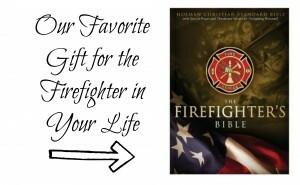 For more information on membership and how to join please visit firefighterwife.com/join. All participants (including your husbands!) will be placed into a special secret Facebook group where we can converse just for this class. Class materials and links will be placed here. Class will be recorded for future playback if you are unable to attend but we encourage you to be live in as many classes as possible to be able to engage, ask questions and really make the most of the course. 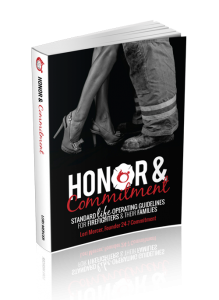 If you are already a member of the Fire Wife Sisterhood, click here to register for this course. We were having trouble getting into the FPU class at our church due to my husband’s work schedule! This is perfect! Thank you!! have all spots been filled?? I signed up for this class! I’m so excited! I’m not a member of the firewife website, how do I become? I ordered and paid for the program material.